closing end of day December 16th for the season. We will be open through Sunday December 16th from 9:00am to 7:00pm. The farm will close December 16th at 7:00pm for the 2018 season. At this time we have a small selection of Fraser Firs up to 7 feet tall. We don't anticipate them to be around much longer! Customers will still be able to cut their own tree from our fields we have 5 to 10 foot trees still available. Field varieties are Sand Pine and Southern Cedar. Field grown trees are priced at $6.00 a foot up to 9 foot a d $7.00 a foot for trees above 9 foot. If you need a tree after December 16th we will do our best to accommodate you and you can cut one down by appointment only. 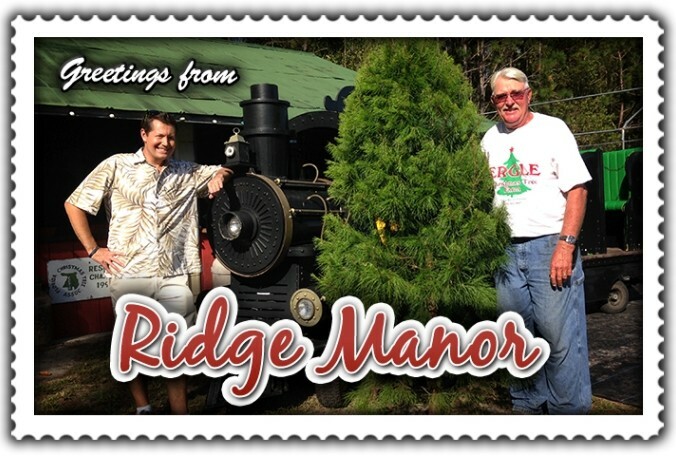 Call 352-583-3647 or 352-346-2745 to schedule appointment to cut a tree after December 16th. You may still get wreaths made from Fraser Fir made to order. Priced $20 to $30 not decorated and $35 to $45 decorated. Larger wreaths available as well by special order. Just call the numbers above! Call 352-346-2745 if you need additional information! Click on the video below to watch us featured on "Florida On A Tankful"
For the latest news and updates sent directly to you email sign up for our newsletter!